Nicholas McGegan Interview with Bruce Duffie . . . . . Though known primarily for Baroque music, Nicholas McGegan is a learned scholar of music from all periods — the Mediaeval chants and Renaissance polyphony right through the recent trends of the current day. But he knows what he likes and makes sure that his engagements reflect his tastes and enthusiasms. His website, like many others, is his name — www.nicholasmcgegan.com — and there one can find photos, itinerary, background, and all the other bits that make up a well-rounded person of the 21st Century. Reproduced at the end of this conversation is something labeled a “Short Biography” (!) from another website. In the summer of 1988, McGegan was in Chicago to conduct the Grant Park Festival, so we met backstage at the James C. Petrillo Music Shell. We had a wide-ranging discussion of all types of music from various centuries. Bruce Duffie: Where is your permanent position? 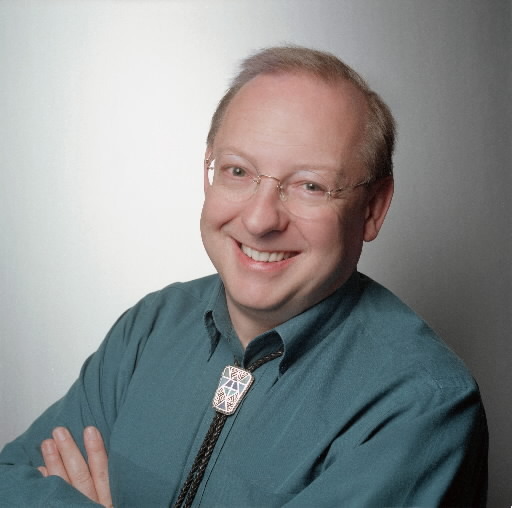 Nicholas McGegan: I conduct with Philharmonia Baroque Orchestra in San Francisco, which I’ve done now since ’85, and prior to that I was a university professor at Washington University in Saint Louis. NM: Ancient music, basically. Performance practice, I think it was called. NM: Of both music and also opera. So I was teaching eighteenth century acting, and making eighteenth century stage machines and things like that. BD: Is it right that we in the twentieth century should be looking back to the eighteenth century? NM: I don’t see why not. Certainly one of the things that’s very important in a university is to do what you might call “arts research,” because if you want to do an eighteenth century opera in a major company, there isn’t the time and there aren’t the resources to see how it might have been done in the eighteenth century. You just have to basically put it on the stage! Therefore, universities are the place to experiment. There’s no right or wrong in the arts, thank God. BD: So not all eighteenth century operas have to be performed as they were in the eighteenth century? NM: Absolutely not! Nothing has to be done in any particular way! The great thing about the arts is you can never be right and you can never be wrong. We can’t reconstruct a Handel opera. We can’t reconstruct an eighteenth century audience; they’re all much too polite now. BD: Then let me just turn the question completely around for a moment. Are we making a mistake for the twenty-first century by leaving so many records of the twentieth century? BD: Will they be, though? BD: The old English Opera Group? NM: Yeah. He then makes a record of it, and then every time an opera company tries to revive that piece, they find singers that sound just like the ones on the record! I think that’s terrible! The conductor and stage director should find singers they want to sing the roles. The fact they don’t sound like Peter Pears should be irrelevant! Peter Pears sounded like himself, and I’m quite pleased that very few tenors sound like him. BD: So then occasionally, when you stumble on a tenor that sounds like Peter Pears or a baritone that’s like Shirley-Quirk, it’s an extra bonus? NM: So long as they can act! [Both laugh] Who wants a lump onstage, even if they sound right? BD: That’s true, that’s true. In opera, where is the balance between the music and the drama? NM: It should be all fifty-fifty. BD: Does it ever make it to fifty-fifty? NM: No, it doesn’t. Opera goes in fashions. For a long time it’s been singers’ opera. You hire the grand diva — usually the bigger, the better — and you hire a director who does his best to make everyone act around her — or him, for that matter. Then you hire a conductor who’ll just follow him or her, regardless. Sometimes it’s conductors’ opera, and right now it’s stage directors’ opera. It’s Peter Sellars’s Don Giovanni, or Zeffirelli’s Turandot. The fact is, it’s conducted by somebody, it’s staged by somebody, it’s designed by somebody, it’s performed by a lot of people, and somebody wrote both the words and the music! It should ideally be an absolute balance; of course, it never is. BD: Well someone’s got to be listed at the top. Who should be sorted out as being at the top? NM: Usually the composer! Because without him... you can generally do without certain things in opera, but the composer, the original product, is hard to get away from. BD: Even back in the eighteenth century, when there were several hands in the pie and some of them unknown? NM: Oh sure, yeah! I stage direct operas as well. I try and cut out the middleman sometimes. It means you end up having rows with yourself! NM: It varies. Sometimes what makes a great stage effect really goes against musical timing, and then you do have to come up with something else. BD: With this experience, when you work with a separate stage director, does this give you more respect for what he has to go through? NM: Oh sure, yes. I also have to be careful not to interfere. There are some stage directors of opera who really have a very hard time reading music. And there are some stage directors that really don’t give a damn about the text. BD: What do they give a damn about? NM: The general effect. There are some stage directors who are glorified traffic cops. NM: Oh, there are still a few! It’s very necessary sometimes, if you’ve got a corps de ballet onstage and you’ve got a chorus onstage and you’ve got lots of soloists on stage. You’ve got to put them somewhere. There are certain times when you have to just direct the traffic! There are some stage directors that are very bad at that, who sit there and really try and explore the hidden meanings of the text, sometimes at the expense of what, actually, the thing looks like! BD: Is there ever a chance that you can go too far in delving for that great hidden meaning of the work? NM: Sure! If you can’t understand the words that are being said, it’s pointless! BD: Then let me ask the big philosophical question. What is the purpose of music, or opera, in society? NM: Oh dear! [Pauses for a moment] Well ultimately, I suppose all the arts have to entertain. Sometimes they teach, although I’m not sure that that didactic function is always present. Some people say, “Will you help me to appreciate this?” One can do that up to a point, but basically I find that many more works of art speak for themselves than one would imagine. I personally, for example, like supertitles. I like doing them. I think they help a lot. BD: Do you prefer supertitles only if the work is sung in original, or also when it is done in translation? NM: It depends. I’ve just done two Monteverdi operas that were translated into English, and I think that’s fine because Monteverdi wrote the pieces in Italian for an Italian audience. But most eighteenth century Italian operas, apart from their French ones, were written for an audience that didn’t understand Italian as its native language. That’s all the Mozarts, nearly all the Handels, and things like Paisiello’s Barber of Seville, which was premiered in Leningrad — well, Saint Petersburg — where everyone, of course, is fluent in Italian! [Laughs] They’re written in such a way, with all those word repeats and everything, that you get the general gist of what’s being said, and then you just watch. The gestures are broader; the vocabulary of the text is drastically reduced from what it is in a Monteverdi opera. So if you have a basic Italian vocabulary of about five hundred words, you can understand a Handel opera, whereas you need about two thousand for a Monteverdi piece. They use the full extent of the language because the whole audience understands it. Often for Handel operas, using supertitles is better. BD: Even with all the repeats? BD: Now a real technical question. Should that title stay up for ten minutes, or should it stay up and disappear, or should it come back periodically? NM: It can just stay up there. There is that lovely thing in eighteenth century opera where time stands still for a little while during the arias, and you’re invited to think about the situation in the opera as it is. It’s nice to have that! You just have a little bit of what the text is about, in the same way as in the eighteenth century the house lights were up for the whole time, anyway. Everyone had a bilingual libretto, so you just looked down and it said, “My heart is like a butterfly.” You read that and knew, “Oh, that’s what it’s about.” Then you just listened to it and watched the performer act. BD: Or talked to your neighbor? NM: Or played cards, yeah! It was said that chess was the perfect antidote to Italian opera because you could play chess during the recitatives, and as the chess got boring, along would come an aria. And just as the aria got boring, it was time for more chess! [Both laugh] That was said in the eighteenth century, admittedly by a Frenchman who didn’t like Italian opera very much anyway, but was probably very good at chess! BD: Well, are we wrong to put audiences who have had a hard day’s work into a darkened theater, and expect them to concentrate on every detail of what’s happening on the stage? NM: Certainly not! I don’t think so. One does notice, from town to town, though, differences of audience concentration. Washington D.C. has some of the sleepier audiences in the United States. The Kennedy Center, I should say, rather than Washington D.C. And I guess if you’ve been in the Pentagon all day, plotting the fate of small South American republics, to come and be expected to concentrate on Poppea must be either too close to the bone, or too difficult! [Both laugh] A San Francisco audience or an L.A. audience is very enthusiastic. The Chicago audience is great! In D.C., it takes them a while. They sound as if they’re clapping in gloves for the first half. I’ve conducted there a lot. BD: Where is the balance between the artistic value and the entertainment value? NM: The artistic value divides down, I wear the tee shirt that says, “I like authentic performance,” but I do, to a very large extent, feel that that’s my problem to get it right. In other words, if I’m using a band of original instruments, I try to get something like the right number of players to make sense. Although at concerts halls in the States or in Europe now, that’s very difficult because most concert halls are much too big. BD: Do you try, then, to seek out smaller venues? NM: Yes, where I can. In San Francisco I’ve done a few things in Davies Hall, which is a marvelous place if they ever decide to revive some of the more bestial Roman sports! It holds about three thousand people, and you couldn’t hear the screams, but it’s not one of the great halls for music. It’s the old problem where you let economists loose on designing buildings for the arts, and they say, “You’ll never pack enough people in for Judy Collins if you make it have two thousand people in it.” So they put five thousand people and no one can hear or see, except for Judy Collins, because it’s all right to the sky! But there seems to be a great shortage of thousand-seat concert halls in the United States, except on university campuses, which is about perfect for chamber music or vocal recitals or chamber orchestras. BD: I was going to ask if there were little auditoriums in high schools and colleges. NM: They are often much better, especially ones that have been designed in the twenties or earlier. But back to what I was saying about the original instruments thing, I feel that if I get the size of the orchestra right, we get the slurs all right and got it back to how it was when Mozart wrote it, that’s all my problem. If it’s a dull performance, no amount of authenticity will save it! It’s rather like serial music, in a way. The fact that it’s twelve-tone is the composer’s problem. You can analyze it to death, but if it’s a good piece or a bad piece has nothing to do with whether it’s a serial piece! It can still be very exciting or very drab. So I’m basically in the business of performing. BD: You have a lot of material to choose from. How do you decide which ones you will choose and which ones you’ll postpone, and which ones you’ll just never get around to? NM: Often, of course, one doesn’t get the choice. Are you free to conduct this piece, or not? If it’s something like the Tales of Hoffmann, which is a piece I adore, then yes! This week in Chicago I’m doing Richard Strauss, who is a composer I’m very fond of. There are composers that I’m not very fond of. I’m not terribly fond of bel canto. I’m not very fond of early Wagner. The Flying Dutchman and Tannhäuser bore me to tears, both musically and aesthetically; these sort of guilt-ridden men who are somehow redeemed by hausfraus with top C’s! It’s just not my idea of fun! BD: But Meistersinger and Parsifal are another kettle of fish? NM: Parsifal is wonderful. Meistersinger is really too long for its own good. It’s like the longest joke in the world, and I’ve forgotten what’s amusing about it after the overture! But it is a glorious sing, in bits. It’s like he’s trying to eat a cake all at once; I prefer it in slices, myself! Tristan is just a wonderful piece, but I would hate to conduct it! NM: I don’t know. There are some people who are short distance runners and some people who are long distance runners. I’m more of a short distance guy. I’d need to train to do that piece. My absolute favorite music is stuff like Mozart operas. I love doing Stravinsky, and I just worked with the Civic Orchestra last night doing Petrouchka, which is a piece that I’ve done several times now. It doesn’t come by every day I get a chance to conduct that piece; it’s lovely. I love doing Brahms, especially trying to lighten it up; to approach it as early nineteenth century music pushed to the middle of the nineteenth century, rather than as Strauss manqué. I like to conduct any music, really, that I have some ideas about. I think it would be a gross impertinence on a conductor’s part to conduct something that he doesn’t really have any ideas about. BD: Do you only conduct masterpieces? NM: Oh no! I have a great love of slightly second-rate music! BD: Do you have any affinity at all for third-rate music? NM: I wouldn’t know how to categorize that. BD: Well, what makes a piece of music great? NM: Now, there’s a question, isn’t it? Something that comes from rehearsals is that feeling that the more you rehearse it, the less you know about it. In other words, it’s a goldmine that you can keep digging and digging and digging, and all that happens is you just find more seams. A piece like The Marriage of Figaro is an obvious example. In every single level, both dramatically and the way it’s composed — Mozart’s approach to the text, the scenic situations — the possibilities of different ways of singing it are infinite! You can just keep going. Whereas, certain operas, like The Flying Dutchman, to me seem to be totally monochromatic. BD: Would you find it, perhaps, the ultimate challenge to make something special out of that work? NM: I’d rather work on other pieces. I’d rather work on Fidelio, to be honest, which is another one that usually gets a rather heavy treatment. Since I’ve done a lot of early music, it is lovely to approach Beethoven as kind of bursting out of the eighteenth century, rather than being this Napoleonic titan writing French Revolutionary music. The atmosphere in which he grew up — the 1770’s and 1780’s — is still the work of Haydn and elegance. Then comes Beethoven who sometimes puts this big Monty Python foot down on it, squashing it flat! But you still have to have the world that he came from in order to squash it! BD: But do we have the world that he came from in our ears and in our eyes as we come to the end of the twentieth century? We’ve lived through world wars and we have all of these economics and the communications, and all of this technical ability. NM: That begs the question of whether one should play any of this music, really. In the eighteenth century, they had this group called the Academy of Ancient Music, which Chris Hogwood named his group after. Its definition of ancient music was any music over twenty years old, which means that a modern group, the Grant Park Academy of Ancient Music, for example, would be able to play early Boulez, as ancient music! Its idea of very modern music, which it wouldn’t play, would be Philip Glass. But it could play anything written up to 1968, which if you think about it, it leaves the field pretty wide open! And that would be considered ancient, fuddy-duddy stuff, things written before 1968. So I think the whole aesthetic has changed. The idea of progress in science, of course, is a fact. Somebody working in the nineteenth century could build upon the theories of somebody in the seventeenth century, and solve all kinds of mathematical or technical problems. But there used to be this strange idea that the equivalent progress could happen in the arts. In other words, Verdi was simply better than Mozart and Wagner was better than Beethoven. Beethoven was okay, but Wagner was better! BD: Just because he’s more recent? BD: When you conduct, are you conducting opinion, or are you conducting fact? NM: I am conducting only my opinions, of course. I don’t know what the facts are. BD: Aren’t the facts those little black spots on the page? NM: Yes, I try and get those. I try to be very faithful to what’s put in the score, when it’s there! I’m just doing Beethoven’s Second, and that piece has a lot of extremely uncomfortable dynamics written into the music; lots of swells that go nowhere; practically every other note in the wind parts is sforzando. It’s a very roughly-written piece, and my job there is actually to rough it up. BD: Not to smooth it over? NM: Not to smooth it over. I am to make it a rather uncomfortable piece, because it seems to me that if Beethoven wrote sforzando, he meant it. And they’re in the most loony places, too! BD: Are the sforzandi that we hear the same as the sforzandi that Beethoven heard? NM: Near enough, I would think, yes. They already had the equivalent of the modern bow by then. BD: But they didn’t have the modern winds and the modern-size halls. NM: No, but Roger Norrington’s Beethoven’s set is done on original instruments, and most of those things are right. Probably more is done off the string now than would have been done then. The halls, of course, are completely different. That would actually have made the music much louder than it is now. There’s wonderful comments about Haydn symphonies in London being very noisy when they were done by fifty piece orchestras in halls that were only a hundred feet long! They should pack the same kind of punch as Bruckner, which of course is very silly, when sometimes modern symphony orchestras put a Haydn symphony first, and then do Bruckner’s Eighth! BD: But of course, our ears have all been hammered by everything that’s gone on in society since then — all the noises, the noise pollution, everything that has assaulted our ears. NM: Yes, well we can never get really back there. It’s the same problem in all the arts. Anyone who’s read anything about Freud, or believes in everything that Freud wrote, sometimes has a problem with Shakespeare! [Both laugh] He was, perhaps, lucky never to have read Freud! Sometimes he agrees with Freud and sometimes he doesn’t, but who cares, actually? We can only be modern. There’s a nice quote from Varèse somewhere saying that no composer is ahead of his time; it’s that the audiences often like to be a few years behind their own! I think that becomes increasingly true. For example, I have conducted no minimalist music in my life, and maybe I should. It’s not my favorite kind of music, but it is what’s happening now. It’s some of the most popular classical music going, if you believe the box office! One of the things I think is very good now is that the range of music from the past that’s being performed is much greater than it was thirty years ago. In terms of opera, it was this very stodgy diet of Verdi and Wagner. All you have to do is to look at the statues that are put up on the tops of the Budapest Opera House or the Paris Opera to see what the repertoire is! Mozart is usually tucked ‘round the corner somewhere! Gluck was about the earliest opera they ever did, and now they’re doing works of Handel and Monteverdi. You’re seeing basically the full range of opera, and it’s increasing. I think that’s very good. One is doing music practically back to the caves, now, and that’s fine, too. The problem comes when one organization tries to play it all; where you have that slightly German system of the town symphony that plays everything from the Monteverdi Vespers up ‘til something by Charles Wuorinen. It’s very good to have different groups, some who like playing Medieval stuff and some who do Renaissance choruses, for example. BD: Is there any danger, though, if we only get specialist groups? BD: Is there nothing good in having the standard orchestra occasionally play Haydn and Mozart? NM: I think it comes down to a simple thing that a modern orchestra doesn’t have the instruments to play music written before 1600 — except in Respighi’s transcriptions, or whatever! But certainly I think it’s great for a modern orchestra to play the B Minor Mass. I think it’s great for as much music to happen as possible. BD: An orchestra will carry a few extra wind and percussion players for the new works. Should they carry, then, a little positive organ for Monteverdi? NM: Certainly they should! They shouldn’t necessarily carry cornetti. There you are talking about specialists. It’s an instrument in which it’s almost impossible to double on anything else because it’s so hard, and you’ve got a very limited repertoire. So there you are, talking about specialists. But they can be brought in. With the orchestra that I run in California, a lot of them play modern instruments in other groups, and that’s fine. In a couple of years, we are going to be playing Brahms, which is also fine. We’ll do a Brahms Serenade, and also we’re going to have some twentieth century commissions for original instruments. BD: Twentieth century commissions for old instruments??? NM: Yeah, why not? They do different things for modern instruments. There’s no longer a problem now that everything can be contact miked, for instance, to be loud. Something as soft as a baroque flute, for example, could be pit against a large number of baroque strings. BD: What if someone today was writing for old instruments in the style of Monteverdi? NM: They could do that, too, if they like. BD: Would it be valid? NM: I don’t know that anything is actually invalid, to turn your question on its head! It’s only style. There’s two things, it seems to me, to make a composition — one is style, and one is ideas! If somebody’s got ideas, they can write in any style they like! It’s what movie music’s all about! Somebody can have all the style in the world — even a very modern style — but if the net result is vapid, then it’s still vapid! BD: Let me turn to technique. Is all your work done in rehearsal, or do you leave a little bit of extra special something for the performance? NM: It varies. For example, when I work in San Francisco I have four six-hour days’ worth of rehearsal for every concert; sometimes more. We’re doing the last three Mozart symphonies in a set, and I have five days rehearsal for this. That’s thirty hours of rehearsal, plus breaks. In something like that, you don’t leave very much for the performance except the actual performance energy. Those pieces haven’t been played that often on original instruments, so you’re concerned about balance. Technically, the E-Flat Symphony is just wretched! NM: It’s just very hard!!! BD: [With mock incredulousness] So??? NM: So you have to practice it a lot! One is concerned with making sure that one has the best classical violin fingerings and where the shifts come, because it’s slightly differently fingered from how it would be in a modern orchestra, if one’s going back to do it as it would have been done in Mozart’s time. But for something like Grant Park here, where I get two two-and-a-half-hour rehearsals basically to throw a concert together, one is concerned only with togetherness of performance, getting some kind of unified style for a piece and working out the technically tricky bits. Then one really puts the gas pedal down at the concert because there the players, after all, can take it. They’re very tip-top professional players. And it’s pointless trying to do a performance in a rehearsal; it’s a waste of good rehearsal time. It’s much better to work out a complex piece of wind counterpoint so that it actually balances, and then that balance will still stay the same. But you can actually really give the concert some bite. BD: Have you ever been involved in conducting a particular concert eight or nine or twelve times? NM: I did seventeen performances of H.M.S. Pinafore once! BD: That’s a stage work, so that’s a little different. But what about concerts where the normal run is two or three or four. NM: I do four on a normal basis in California. BD: Then how do you keep that fourth concert fresh? Or, perhaps more important, how do you keep the third concert fresh? NM: The second one is usually the worst! It’s like second nights of operas are the worst. BD: Because everything is a letdown? NM: Everything is a letdown. There’s always the magic ingredient, of course, which is the audience. The audience in San Francisco, for example, is much more polite than an audience in Berkeley. An audience in Berkeley will throw flowers, shout hooray, share their karma with you, but a San Francisco audience is a little bit more clapping with gloves on. They love it, but they’re, “We’re a little bit too sophisticated to go wild.” And the orchestra, of course, responds to the sort of reception it gets. If it’s a very punchy audience that clap the orchestra as they walk on, you’re bound to give a good concert. There’s also the whole psychology of the concert. If somebody really screws up or something doesn’t go well or the conductor makes a terrible mistake, then obviously the whole thing can collapse, even if it started wonderfully. Sometimes concerts can feel not very good, but if you listen to a tape of them, they’re actually much better than you think. Or, they’re very correct, whereas a last concert can often be a bit wild because you start taking risks that maybe you shouldn’t. So it isn’t quite such a predictable recipe as one might like. BD: You’ve made some recordings. Do you conduct any differently in the studio than you do in front of an audience? NM: It depends. I record in California and also in Hungary, and in both cases I’m very lucky because I get a lot of rehearsal time. I’m just about to go off to Europe. I get two weeks rehearsal for a Vivaldi oratorio, which means that when we do it into the mike, it’s much more like a performance because we’ve rehearsed it as it if were an opera. BD: Because you know it’s a recording, do you take the chances you might on a last performance? NM: It’s not recorded live, in that sense; it’s done in sessions. But we always do two concerts first, so we know how it should sound in performance. Then everyone is given a tape of those performances so that they can hear what they did with the miking in place, so they can hear what it’s like. If I say they’re singing flat, they can really hear it. Or, they might think the conductor’s deaf, but, that’s an absolute luxury! With the California orchestra, it’s more or less a rule that we never record anything we’ve never played. And we’re going to start recording live. I far prefer that. We’re doing the Handel oratorio Susanna next year. We’re going to just do three performances in the same building, and simply keep the mikes on all the time. Then we will have one patch day afterwards, just in case, for example, somebody really coughed very violently in a quiet recitative. BD: I would think you could lift that out of another performance instead. NM: One would hope so, but if there’s a problem with an airplane, you can never predict. Even in a recording studio now, you can’t find a place that’s immune to airplanes. In Hungary last time we had a cannon that went off, mysteriously, to announce somebody’s birthday. That was during a cadenza with a top D in it, which this woman only got about three times! Somehow they managed to piece it together without the cannon, but it was very dicey. There’s certain things you can’t predict. But on the whole, I have a slightly quirky attitude to CDs. I think they’re wonderful, but I wish they’d self-destruct after five years! This idea of now making things that last forever... You can give them to your dog and it will still sound the same. BD: Meaning you don’t want to hear performances you made six years ago? NM: I’m interested in them, but I think it has a slightly stifling effect. It’s what you were asking about earlier — is the twentieth century giving too much to the twenty-first? It’s great if the record company keeps things for archival purposes, for scholars to see what you did, but not the idea that your performance can never be improved — you know it can, not necessarily be improved, but changed — and then all you get is this thing that’s indestructible! BD: Is there any chance that the recording, because of the piecing and futzing, is a fraud? NM: Of course it’s a fraud! If one thinks of it as a true representation of a performance, only a live recording can be that. BD: And even there you have the chance to patch from different performances. NM: You have that chance. I love those old recordings. I just bought all of Rachmaninoff’s concertos being played by Rachmaninoff. They’re all live; there is no patching, and there’s a few bits — mostly in the orchestra, let it be said — where there’s some fluffs! I think it’s wonderful because the force of ideas is much more important than one flat note. It’s irrelevant on the piano, anyway. There’s also some of those wonderful Heifetz recordings. It seems to me the best thing about CDs now is the way they can clean up recordings from the twenties and thirties. Those are mostly one take, one shot deals. NM: Direct to disk, and I think they’re fabulous! I love performances with mistakes in them. I don’t mind at all. BD: [Peevishly] You don’t purposely put a few mistakes in your records, though? BD: Tell me about some of the first recordings you made. NM: Let me think. I made my first in ’74, a series of flute albums, baroque flute. There were some J.C. Bach sonatas, some C.P.E. Bach quartets, a set of flute chamber music of the Bach family, some Vivaldi flute concertos, that kind of stuff. Those were all in the seventies with Chris Hogwood and the Academy of Ancient Music. I played in the Academy of Ancient Music through most of the complete Mozart symphonies. BD: On flute or harpsichord? NM: I was playing second flute, and then harpsichord when there wasn’t a flute part. So I got to play in a lot of those — more symphonies than Mozart ever knew he wrote. It was a great, great experience. I can’t honestly say that it was always great fun to make, because you would sit there for two weeks at a time and just play into the microphone. And things weren’t always done in sequence. We’d sometimes have a morning of minuets, without knowing exactly to what symphony they belonged! You did get a bit shell-shocked after a while, if you do three slow movements in a morning. And we didn’t rehearse much. BD: That doesn’t counteract all of the build-up that Mozart had made into his symphonies? NM: Probably, yes! [Both laugh] The English recording techniques are very, very high pressured. You just go in and do it and get out. There’s not much time for anything like a conductor saying, “I really have some good ideas about this piece. Can we experiment? Let’s do something differently.” The difference was doing it on original instruments. Poor Christopher; we didn’t have any time! We had one day’s rehearsal for a week’s worth of recording. It’s not much, you know. BD: When did you start conducting? NM: I started when I was at university, so that’s 1970. I made three records of operas by Rameau at the end of the seventies and early eighties including Naïs and Pygmalion, which took them five years to issue for some reason. NM: Erato in France, and two of those were made in France. Then in ’84 I started working with Hungaroton in the summers, and I’ve done either an opera or an oratorio every year there. So far that’s two Handel operas, Atalanta and Il Pastor Fido, and an oratorio, the Brockes Passion. And we did a Telemann opera, The Patience of Socrates, which came out this year. BD: Was that in German? NM: In German and Italian. The serious bits are in Italian; the comic bits are in German. The great thing with Hungaroton is they let me do really weird repertoire. So an Alessandro Scarlatti oratorio, Judith, is coming out in a couple of months, and we did some Monteverdi and some Vivaldi. I got to play piano, which is rather nice. I did Schumann’s Dichterliebe and Liederkreis, on an old Straub piano with Paul Esswood singing countertenor, believe it or not. NM: And why not? Now there’s a nice piece of absolutely non-authentic something! But he’s a damn good musician and he’s a very good singer, and he likes singing Schumann. So he did and I think it’s absolutely fine! BD: If women can sing Winterreise, I suppose a countertenor can sing Dichterliebe! NM: Why not? It’s absolutely fine! I had a great time playing, too. I’m just about to go back there to do a Vivaldi oratorio called Juditha Triumphans. BD: There is an old recording of that. NM: Yes, but this is complete. Then next year we do a Telemann oratorio, and the year after will be a Haydn opera. It’s sort of nice filling in the cracks repertoire. 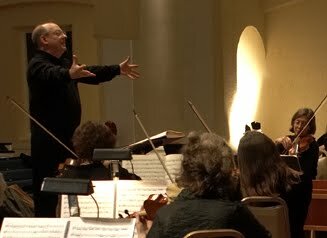 Then I work with Harmonia Mundi and the Philharmonia Baroque in San Francisco. We’ve done Handel’s Apollo and Dafne, some Vivaldi flute concertos, and some arias for Senesino, who was one of Handel’s singers. The Water Music is coming out, and the Complete Mozart horn concertos and rondos. So that’s quite a lot, actually, especially for someone who lives in the States, and especially in early music, because American record companies don’t have the same kind of paternal attitude that Decca or Oiseau Lyre have, getting Trevor Pinnock or Chris Hogwood started! Decca put a huge investment into the Academy of Ancient Music. BD: You were born in London? NM: I was born between London and Cambridge, yeah. I’ve been in the States now for just under ten years, on and off. I still go back to Europe quite a lot. BD: Why did you decide to leave? NM: Because I was asked to come and teach, that’s why! I had just got divorced and I thought it was quite a good idea to get out of London for a while, even if it was to Saint Louis, which I ended up loving as a city! It’s not, perhaps, as exciting as Chicago, but it’s one of those cities, like Pittsburgh, that doesn’t have the greatest reputation, but if you actually live there it’s very nice. NM: I don’t really know how it should be pronounced, to tell you the truth. It’s one of those crazy Irish names. BD: It should be pronounced the way you pronounce it. NM: Exactly! It means the son of Hugh, that’s all I know! I have no Irish connections now. The family left in mid-eighteenth century and went to Scotland. BD: You don’t have any passion to bring our some old Irish music? NM: Not particularly! I used to enjoy playing it on the flute, but they always play the flute backwards. A lot of the Irish players play their flutes going to the left instead of the right. I can’t do that! BD: Can you also play recorder? NM: Almost. I play a little bit. I’ve been on a couple of recordings playing it. BD: So then on all the recordings with you as flutist, it’s a transverse flute? BD: I guess people assume it’s easy because everyone has those little tonettes that they play as children. NM: Yeah. The thing that’s really hard about them is you just play little bits of tinsel in concerts. You have no chance to warm up. You have to come in and play some little solo. And they’re rather unwieldy. They’re very hard to play in tune, and they’re very responsive to temperature, so if a concert hall is stifling, they’re always sharp. Otherwise, they’re usually flat. BD: Well now here’s a good twentieth century question. Are we, perhaps, more demanding that you play in tune than Handel or Monteverdi were? NM: I don’t know; there’s no means of telling. There was an attitude thirty or forty years ago that everyone until the present day had cloth ears! There’s a lovely bit in one of the old Grove Dictionaries that talks about Corelli’s violin playing, which would have been painful to us now because he used what they described as a fearful implement, in other words the baroque bow! That’s an opinion, but who knows? BD: Was Handel or Monteverdi more satisfied with a performance that we would not be satisfied with? NM: There’s just no means of telling. There’s a record that Monteverdi did rehearse an opera for six months. There’s very good evidence with Bellini and Donizetti that they rehearsed an opera as soon as it was finished, and sometimes beforehand. My gut reaction is there’s probably about as many good performances now as there were then, and probably about as many bad ones! BD: But are the good performances today better than the good performances two hundred years ago? NM: Who can say? They might be a little bit more organized now. On the other hand, I think there’s somewhere in the background of baroque music a slightly larger element of what’s now become jazz. That sort of free flight element has slightly left classical music. With a baroque orchestra, if you say, “Okay, there’s a pause here and the first oboist will improvise a cadenza,” that first oboist on a baroque oboe is just dying to do that! They just do it. Whereas if you turn around to Chicago Symphony and say, “Okay, would you like to improvise a cadenza, please?” they’d strike! It’s much more organized. Also one has to remember that an orchestra in the seventeenth or eighteenth century was playing basically modern music in one style. So you got to be very good at it! BD: And also they were playing the popular music of the day. NM: They were much more like a Broadway group. BD: Are we now blurring the lines between what has gone off and become popular in jazz, and what has gone off and become classical? NM: I think so, yes. For example, playing jazz piano, which I used to do a little bit, and playing harpsichord continuo are remarkably similar! You have a bass line, or a bass scheme, and you just have to doodlebug over it! That’s what a continuo is, really, according to the guidelines set down in the figured bass, if there is any. BD: Perhaps accompanying some recitatives in the comic opera would be almost like playing jazz piano. NM: It is very much. The temptation is to overdo it, just as it is in jazz piano. People want to get too clever and to try to show off. It’s interesting, for example, that a lot of eighteenth century orchestral parts contain mistakes. Those parts have obviously been used for quite a long time, but the mistakes are uncorrected. You get things like [sings a tune with a flat note at the end], instead of [sings the tune with correct note]. It’s obviously the last note of the piece, and it’s obviously in the tonic key, so it’s not correct. It seems very likely that they just used their ears, rather than playing what was put in front of them! The training increasingly now is to be able to play what’s put in front of you. BD: Because it’s not going to sound correct in the first time? NM: Yeah. Composers put so much more in — crescendos, diminuendos, all this. The training is to be able to sight read, at the very least, Janáček! BD: What advice do you have for someone who wants to compose today? NM: My advice is good luck, since I can’t really do it! It’s always the same balance, isn’t it, between style and ideas. Style is a bit like fashion. Nowadays people seem to be able to wear more different kinds of things. You can wear more or less what you like these days, whereas even thirty years ago, you had to wear a tie for this and you had to wear a long skirt for that. BD: And you had to compose in a serial manner. NM: Yeah. Nowadays you can really do what you like. Unfortunately, copious freedom is a great deal harder to deal with than rules because rules can at least be learned! If you’ve actually got to sit down and make your own up, it’s rather tough. You can compose in the style of Delius if you want to, as long as you have maybe better ideas! Delius is not one of my favorite composers! BD: What advice do you have for conductors? NM: Again, it’s ideas. I said this earlier — it’s a great impertinence for a conductor to conduct a piece that he doesn’t have any ideas about. I have almost never conducted a piece that I don’t like. I think that’s right. I’ve conducted some pieces that I didn’t think I’d like. I would love, for example, to conduct something like Puccini’s Manon Lescaut, because I think it’s usually vastly overblown when it’s performed nowadays. BD: You’d like to rein it in? NM: Rein it in. Puccini’s very, very subtle — dolcissimo ritardando which is now stretched out and it’s twenty feet long! Then the next time he says molto ritardando, and the two come out the same length, and they obviously shouldn’t. I think it would be nice to have a nonfat version of some of the Puccini operas just for once! Not historically; I’m just trying to do what he wrote. He certainly knew what he was writing! BD: Should you play what someone writes, or play what someone means? NM: You mean, if they’re not the same thing? BD: Are they always the same thing? NM: No, they’re not. The lovely example of that, which is great fun, is Bartók, who is incredibly precise with his stopwatch and everything! He’s like a scientist doing little experiments. A friend of mine in Hungary did this wonderful thing of taking old Bartók’s recorded performances of his own piano pieces and comparing them to the score, and they’re never even close! Of course, there is the composer changing his own music. I don’t sit there and follow metronome marks slavishly, but the difference between a dolcissimo ritardando and a mega ritardando is emotional. It’s a question of underplaying one, and overplaying the other. BD: So it really doesn’t matter where you start, but then once you start, everything within it is relative? NM: Yes. If there are two cadences, you have to decide which one is going to get the juice. And if Puccini tells you, then it’s the second one and not the first, or the other way around. It’s not both of them. I think self-indulgence is a characteristic that can be underplayed! But that’s a purely personal approach to the music. The composer doesn’t always help. NM: The use of ornaments is a very, very difficult question. Ornaments, ideally, should be improvised. That’s what they’re about, and to have them when they’re all written down and organized somehow defeats the purpose a little bit. It’s like a butterfly collection — they’re all beautiful, but they’ve all got a pin stuck through them, so they’re apt to be very pretty, but rather dead. I think there’s a danger in going to treatise books, because a treatise book, although it can be full of very useful information, is not often very much more than a cookbook. It still doesn’t help you serve the dish, even if it tells you what the ingredients are! And it doesn’t always tell you what the exceptions are. You always have to know, with a treatise book, where the guy is coming from. He might be saying, “I really hate all this modern music, and I want to go back to how it was when I was a kid, when we did things right!” So you can tell that what he’s saying about modern things — you basically learn everything from everything that he dislikes, rather than everything he likes! There are the how-to books, which are very dangerous because it’s like “How to Paint in Ten Easy Lessons,” or “How to Play the Flute in Ten Easy Lessons.” “How to Ornament” is only one guy’s opinion, and they’re often very didactic. BD: Are any of the volumes “How to Play My Music” valid? NM: They’re certainly interesting. Sometimes the composer’s judgment of his own music is very strange, especially when they all love the pieces that are the least successful! They all love their Frau Ohne Schatten and Fanciulla del West, and they see that as their great masterpiece! All they’re really trying to tell you is buy that one, because the scores haven’t sold out in the first edition yet! NM: Have a good time! Don’t be too polite. I mean that in every sense! If something is not liked, then say so — but not to the full Italian sense of throwing dead cats at the soprano, which I’ve actually seen in Mantua once! I thought it was hysterical, but I’d hate to have been the soprano! [Both laugh] But it must have been premeditated. You’d have to come in with a dead cat in a plastic bag, knowing that you’re going to hate it! BD: Or at least go out at intermission and find one! NM: [Smiles] Find one, yes... I think there always is, in the arts, a certain sort of snobbism. If something comes from Europe, it must be good. That’s absolute crap, or course! It can either be good or bad no matter where it comes from. There are plenty of players who come from Milwaukee who play a great deal better than people who come from Paris, so I think that sort of snobbism is dangerous. If something’s enjoyable, then it’s enjoyable. If it’s not, it’s not. There was a very nice review in the New York Times, I seem to remember, a couple of years ago, about a performance by the Soviet Emigré’s Orchestra, or something like that, saying that in terms of all that one knows about Bach, this performance was absolutely awful, except that on its own terms, it was brilliant! They were using vibrato and were playing Bach concertos on pianos, or something like that! But they did it with such conviction that while it was going on, the fact that it could be done in a totally different way — with harpsichords and original instruments — is fine, but the fact is, it doesn’t really matter if it was all ‘wrong’. The fact is, it was very good! So the fact that one is using original instruments or not using original instruments is neither right nor wrong. It’s a question of whether it’s a good performance or not. A dull performance on original instruments is a very dull affair! BD: Do you always give good performances? BD: I assume you try, though. NM: One always tries. In an opera, for example, the conductor is only one of many ingredients that can go wrong! I always try to put everything into it. I do like taking risks. I believe very much in the performance. If I’ve got two performances, I try to make sure they’re not the same. BD: But you don’t try to make them different, just to be different, do you? NM: Oh, no, no, no! I try to respond to how I feel at the time. The idea that you do everything you can to be correct, and then somehow that’s enough, is like saying, “We’re going to act Hamlet with all the words in the right order tonight.” [Both laugh] It’s fine, but that’s where you start, not where you finish. It’s not the ultimate be-all and end-all of the performance! NM: I think music’s got a great deal more going for it than certain things, like the future of the world! Music has very rarely done anyone any harm. I would think that music’s got a pretty good chance. It seems to me that more and more people are listening to classical music. I don’t know if that’s the case; I just sort of feel it somehow. I have hope with what’s going on with the cutting edge, as it were, in the new music that’s being created now. I think that people like Philip Glass are doing a marvelous job at popularizing modern music. We haven’t had a sort of cult figure, classical composer, for about a hundred years! BD: The last one would probably be Rachmaninoff. NM: Probably Rachmaninoff, and I think that’s great. Webern is very good music, but it’s not in the Hit Parade. BD: Will the audience that comes to a concert because of Philip Glass stay for the Beethoven or the Bruckner? NM: One would hope so. I think it’s a very encouraging trend, too, that many more centuries of music are being performed and are being recorded. When I was at college, the only Medieval music that you would get were a couple of records from Noah Greenburg, and a couple of records from the Early Music Consort of London. Now you can get practically everything from caveman to Norman conquest! BD: And much of it duplicated and triplicated! NM: Sure! You’ve got the complete run of Haydn symphonies on modern instruments. You’ve got one that’s coming out on original instruments, and a second one in the works. Plus Beethoven symphonies galore and operas that are terrifically significant if you read music history, but I never heard until after I’d managed to write many essays on them! The possibilities for music students bluffing now is much less than it was, and I think that’s a terribly encouraging trend. I hope that doesn’t mean that now that there’s been a performance of this Gluck opera there’ll never be another, because that will mean that all this stuff will get stuck in the time warp with the 1980’s. We might find in 2020, if I’m still around — that’s when my driving license expires in England, so I hope I will be — that performances from today are as quaint then as Mengelberg’s performances from the thirties are now. They are wonderful in their own way, but we might find them very quaint. One might find an authentic Saint Matthew Passion just like terribly dry! BD: Are you going to progress, or are you going to just continue to play the way you’ve been playing? NM: I hope to progress. Certain things fascinate me, for example, like portamento. I was told some wonderful evidence about Salieri writing letters to the paper in 1804, saying this new-fangled way of playing — using slides — was disgusting! This means that if you play Beethoven’s Second, you probably shouldn’t use portamenti; if you play Beethoven’s Sixth, you probably should. Now, that’s an interesting thing! How does that effect the way you might finger the music? How you finger the violin part affects how you play it! Now maybe you might think that’s sort of being like super-authentic, but it’s interesting. It’s an interesting thing to experiment with. BD: And it changes the impact. NM: It changes the impact. If you do, say, Beethoven’s Second and Schubert’s Unfinished, they should actually sound twenty years apart. To a lot of people now, they sound as if they were written in the same year! One should sound significantly later than the other. They probably shouldn’t even be performed at the same pitch! BD: What pitch do you use? NM: One has to use convenience pitches, 440 or 460 for Monteverdi. I like 460. BD: [Genuinely surprised] That high? NM: Yeah. It means the basses can actually sing the low notes. And 392 for French music, 415 for baroque; maybe it’s a bit high for Bach and a bit low for Handel; 430 for classical music. You know, who cares? BD: Do you use well temperament or equal temperament? NM: I don’t use equal temperament! BD: Do you use meantone? NM: Silverman or something like that for Bach, and Young or Velotti for Vivaldi or Handel, and something like Young for Mozart. It’s very, very mild, but it does favor the common keys. If you’re playing with a baroque flute that’s got an A-flat and a G-sharp, they’re vastly different notes and you have to be able to cope with it. That puts a nice emotional sheen on the keys. If you suddenly start playing in E Major — that lovely chorus at the beginning of the last part of The Creation, for example — with flat G-Sharps, as you have on the flute, it sounds absolutely stunning when those three flutes play together! There’s a nice thing in a singing treatise in the 1830s, which probably is the sort of thing that one takes notice of, which says that singers should never practice with pianos because, being in equal temperament, they’re too out of tune for use! That’s something that’s interesting; a nice little nugget of information that somebody wrote which is obviously a bugbear of a singing teacher. But nevertheless, maybe when he grew up — around 1800 — that was the philosophy at the time. Why not? The ultimate in flexibility is what one needs, really. NM: Thank you for interviewing me! You’re a very good interviewer! You ask the right questions. Talking about me as a conductor, I had an indecently good time! I can’t believe how much fun I got out of it! I hope that communicates in the performances. It should. If the conductor’s not having a good time and the orchestra’s having a lousy time, unless it’s a very weepy piece of music, then there’s not much hope for the audience, really! The English keyboard player, flutist, and conductor, Nicholas McGegan, studied piano at London’s Trinity College of Music in 1968. He also learned to play the flute, specializing in the Baroque flute. He pursued his education at Corpus Christi College, Cambridge, receiving B.A. in 1972, and at Maagdalen College, Oxford, receiving M.A. in 1976. Nicholas McGegan was active as a flutist, harpsichordist, fortepianist, and pianist in London, where he was also professor of Baroque flute (1973-1979) and music history (1975-1979) and director of early music (1973-1980) at the Royal College of Music. 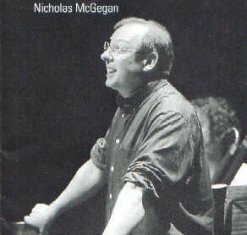 Nicholas McGegan has been well known for his work as conductor of major symphony orchestras and opera companies worldwide. Equally at home with modern- and period-instrument orchestras, his repertoire ranges from Georg Frideric Handel and Antonio Vivaldi through Mozart and the complete symphonies of Beethoven to Richard Strauss and Benjamin Britten. Nicholas McGegan recently joined the artistic leadership of The Saint Paul Chamber Orchestra as Baroque Series Director to develop programs and engage artists for the ensemble’s popular Baroque Series. Since 1990, Nicholas McGegan has also been the Artistic Director of the Göttingen Händel Festival, the oldest festival for baroque music in the world. 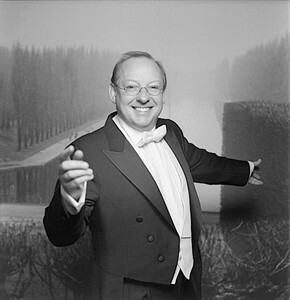 Under his directorship, the Festival has returned to presenting fully staged performances of Georg Frideric Handel operas such as those that marked its launch in 1920 and the revival of interest in that composer’s work.McGegan’s recording of the Göttingen Ariodante with Lorraine Hunt Lieberson received the Gramophone Award for 1996 in the category of Early Opera. 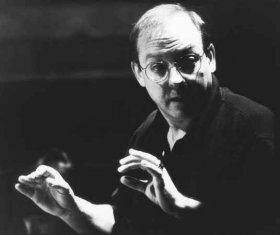 In the fall of 1997, Nicholas McGegan made his début with Britain’s Royal Opera, conducting the world premiere of the Mark Morris production of Rameau’s Platée in London. In 2000, he took part in the opening season at the renovated Royal Opera House, conducting Mozart’s La Clemenza di Tito with Vesselina Kazarova among the cast. "The Mozart Experience," a recording of Mozart arias with him conducting the Royal Opera House Orchestra was released in 1998. 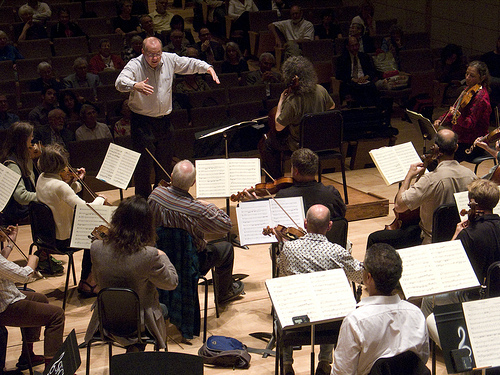 For sixteen years, Nicholas McGegan was Music Director of San Francisco’s Philharmonia Baroque Orchestra (PBO) where he was recently named that orchestra’s Music Director Laureate, a position that allows him to expand his international commitments while continuing to direct the orchestra in major projects and a number of programs. During his tenure as Music Director, he helped establish the PBO as the leading original instrument orchestra in the USA and led them in regularly sold-out subscription seasons. In 1999 the PBO joined him at the Göttingen Händel Festival for performances of G.F. Handel’s opera Arianna and the ballet Terpsichore. Over the years, he and the PBO have collaborated on more than 30 recordings including a world premiere recording of G.F. Handel’s Susanna which received a Gramophone Award. Most recently BMG/Deutsche Harmonia Mundi released their recording of Thomas Arne’s Alfred and a recording of suites from Rameau’s Platée and Dardanus in conjunction with the enormously successful American premiere of Platée with the Mark Morris Dance Group. Nicholas McGegan is the founder-director of the chamber music group The Arcadian Academy, which specializes in music from the 17th and early 18th centuries, mostly by Italian composers. They tour regularly in the USA and Europe and have won several honors for their recordings. Their debut recording for Deutsche Harmonia Mundi - Scarlatti Cantatas with soprano Christine Brandes - was named "Recording of the Month" and "Editor’s Choice" by Gramophone magazine. The second CD in the Scarlatti series, featuring counte-tenor David Daniels, was released in October 1998 in conjunction with a world tour to Berkeley, Ann Arbor, New York, Vienna, London and Frankfurt. The group has received two Diapasons d’Or for their recordings of Nicola Matteis’ "Ayres for the Violin", volumes I and II. The third Scarlatti CD, featuring Brian Asawa, has been released. A CD of Scarlatti duet cantatas will appear next year. 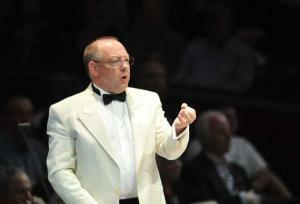 As guest conductor, Nicholas McGegan regularly appears with major symphony orchestras worldwide. Among those in the United States are the Atlanta, Boston, Detroit, Houston, Minnesota, Montreal, National (D.C.), New World (Florida), San Francisco, and St. Louis Symphony Orchestras and the Aspen, Grant Park and Ojai Festivals (he was music director for Ojai in 1988). 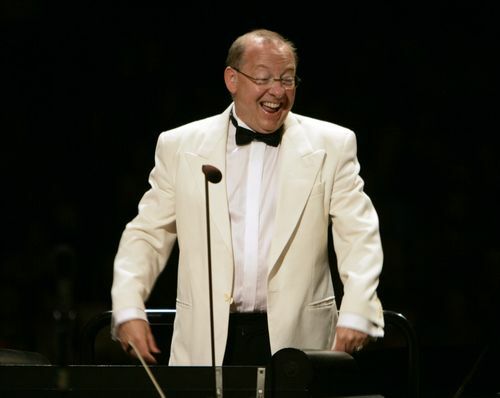 Outside the USA, he has led the City of Birmingham Symphony Orchestra, the Academy of St. Martin in the Fields, the Orchestra of the Age of Enlightenment, as well as the Jerusalem Symphony, L'Orchestre de la Suisse Romande, the Swedish Chamber Orchestra, and orchestras in Lithuania, Hungary, Austria and Italy. In Australia he has worked with the Sydney, Melbourne, and West Australian Symphonies and in 1999 he made his first visits to Asia, conducting the Malaysian Philharmonic. He has a strong commitment to promoting young musicians and is a regular mentor to the New World Symphony and was head of the Pre-Classical Program at the Pacific Music Festival. 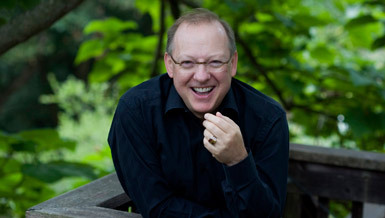 Nicholas McGegan has conducted more than forty operas in Europe and the USA ranging from Monteverdi to Igor Stravinsky. These include the major Mozart operas, many by G.F. Handel, and also works by Haydn, Gluck, Rameau, Martin y Soler, Purcell, Landi, and Offenbach. 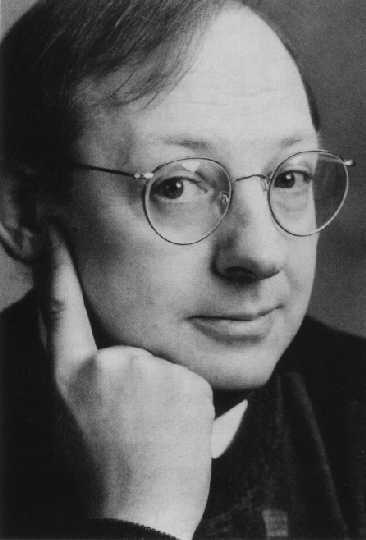 From 1992- 1998, Nicholas McGegan was Principal Guest Conductor at Scottish Opera, and he was Principal Conductor at Sweden’s Drottningholm Theatre from 1993-1995, during which time he conducted his own edition of Philidor’s Tom Jones in conjunction with radio and television broadcasts. 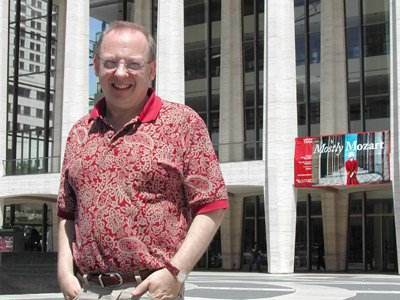 He has also conducted at the English National Opera in London, Santa Fe Opera, and Washington Opera. 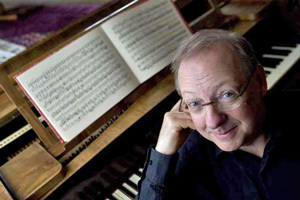 Nicholas McGegan has received an honorary degree from the Royal College of Music of London. He has been awarded the prestigious Händel prize from the Halle Händel Festival in Germany, and in 1996 was presented with the Drottningholmsteaterns Vänners Hederstecken, the honorary medal of the Friends of the Drottningholm Theatre. Nicholas McGegan’s recording contract with BMG/Deutsche Harmonia Mundi is adding a range of opera, orchestral and chamber music projects to a discography that already includes more than 70 recordings on BMG/Conifer, Classic FM, Decca, Erato, Harmonia Mundi USA, Hungaroton, Koch and Reference Recordings. Nicholas McGegan is on the advisory boards of the Maryland Handel Festival and London’s Handel House. This interview was recorded in Chicago on July 19, 1988. Portions (along with recordings) were used on WNIB in each of the following two years, and again in 1995 and 2000. This transcription was made and posted on this website in 2009.